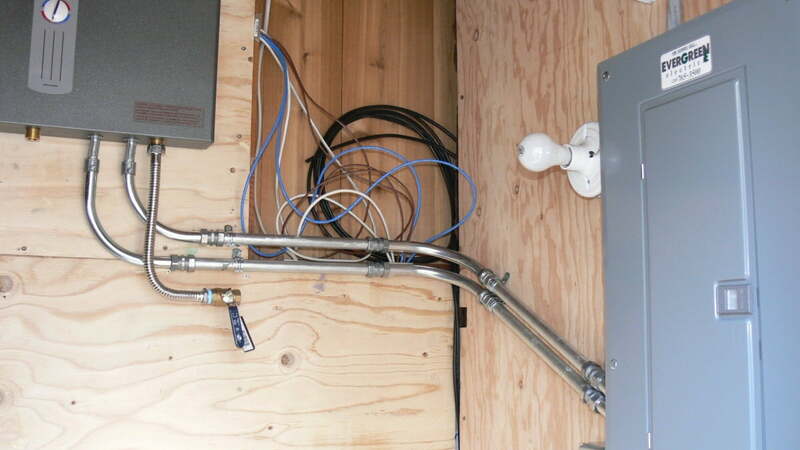 Tankless water heaters are great, and for cabins, they’re really great. They do, however, come with some downsides. That said, I think tankless water heaters are ideal for cabins and of all the upgrades I have made at the cabin, replacing the traditional water heater with this tankless units is one of my favorites. The benefits of a tankless water heater are many; small size/wall mountable, unlimited hot water, instant hot water (no waiting to heat the tank of water) and more efficient water heating/lower energy use. The downsides to tankless water heaters include; large instantaneous energy requirements (electric or gas), cost of the unit/installation, and, maybe most importantly, heating limitations based on flow and inlet water temperature. For us, we were interested in saving space. We needed to move a furnace into our smallish utility room and getting rid of the old, floor standing tank water heater freed up the space we needed to install a new furnace. The small size and space savings of a wall mounted tankless water heater is pretty amazing – they literally take up the space of a briefcase. And while the space savings is great, the biggest benefit we have found after converting to tankless is the instant-on, ready-when-we-get-there hot water. Not needing to get hot water for an occasional-use property like our cabin is huge. Tankless water heaters + cabins = match made in heaven! A tankless water heater offers space savings, endless hot water, lower cost of operation and no tank heating delays with the trade-off of higher initial cost and hot water flow limitations. On demand tankless water heaters are typically offered with one of two fuel sources, gas (natural gas or propane) or electric. Selecting between gas and electric balances costs, performance, installation and maintenance requirements of each. 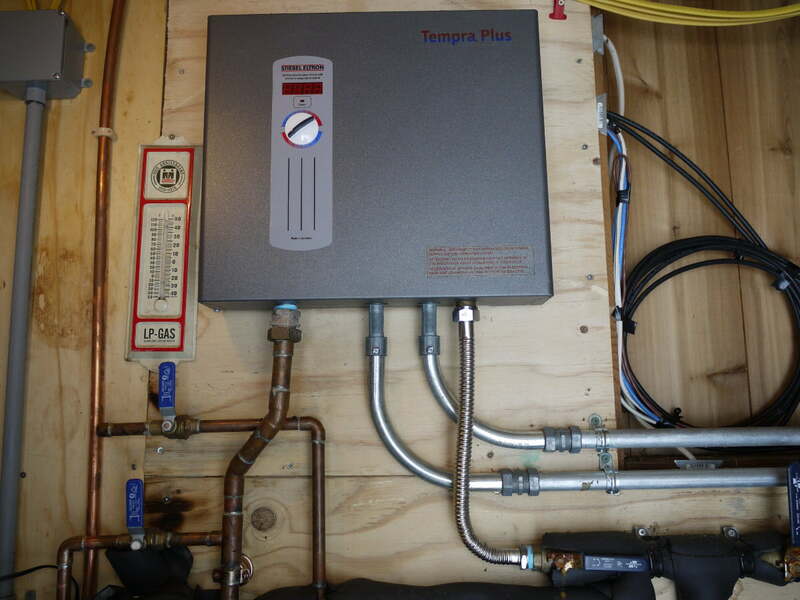 Get Your Own Tankless Water Heater Once you decide on a tankless water heater, you will need it installed. Installation for these units can be expensive, especially for gas units. For many DIYers, installation of a tankless water heater is a fairly straightforward project. 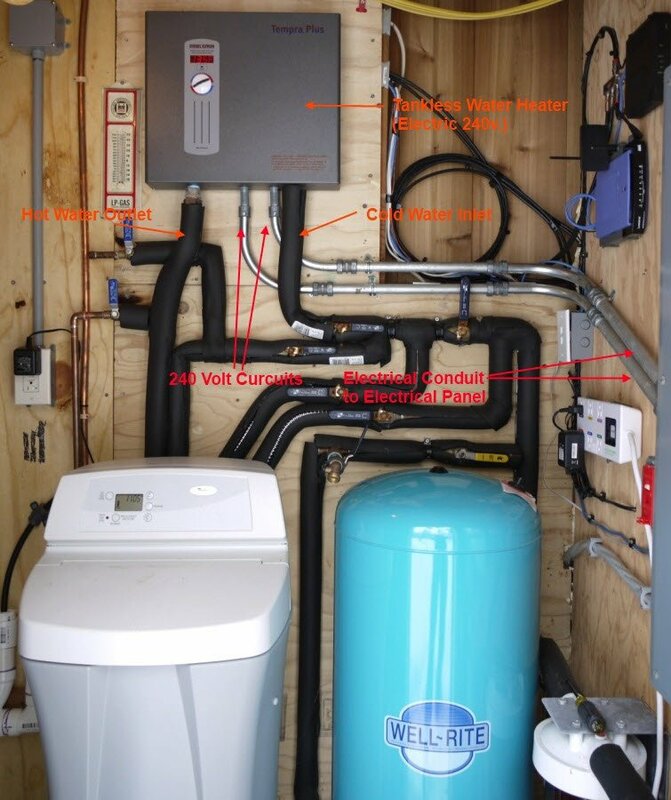 Read on for a step by step of the installation of my electric tankless water heater. I rate this an advanced level project simply because of the high voltage, high amperage electrical work. Due to the potential danger of working with high voltage, high amperage circuits, do not attempt the electrical portion of this project unless you are qualified to do so. You could certainly mount and plumb the unit and hire out the wiring. Safety first. 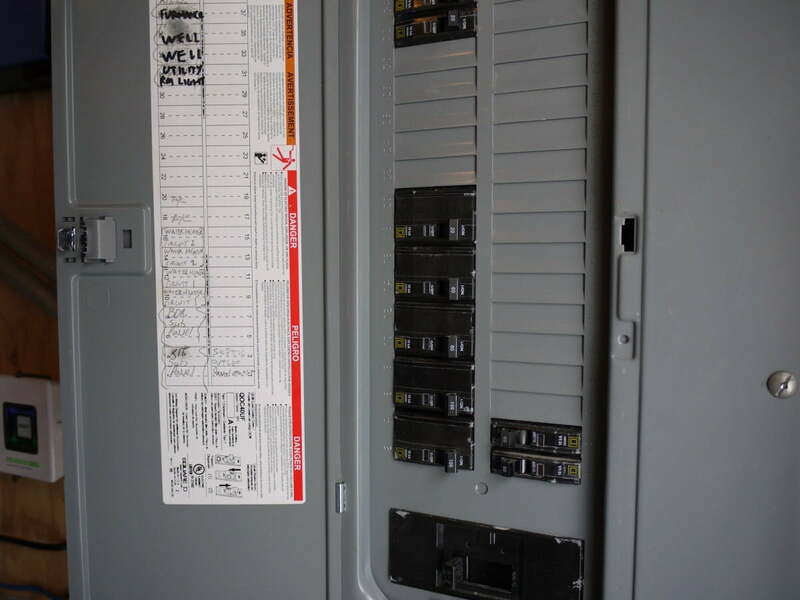 Prior to any electrical work ensure that the main breaker panel is off. Consult federal, state and local codes. Call a qualified Electrician if you have any questions or not comfortable with this type of electrical work. Plan water heater placement.Consider proximity to electrical supply, plumbing connections and accessibility for temperature adjustment and service. Also consider plumbing distance from heater to end use fixtures. Long plumbing runs will result in longer lag time between faucet opening and heated water arrival. Plan placement of tankless water heater — consider access to unit, ease of plumbing, distance to end use (longer = more lag time for hot water) and ease of wiring. Assemble water heater, supplies and tools.Gather water heater, plumbing supplies, electrical supplies and tools. 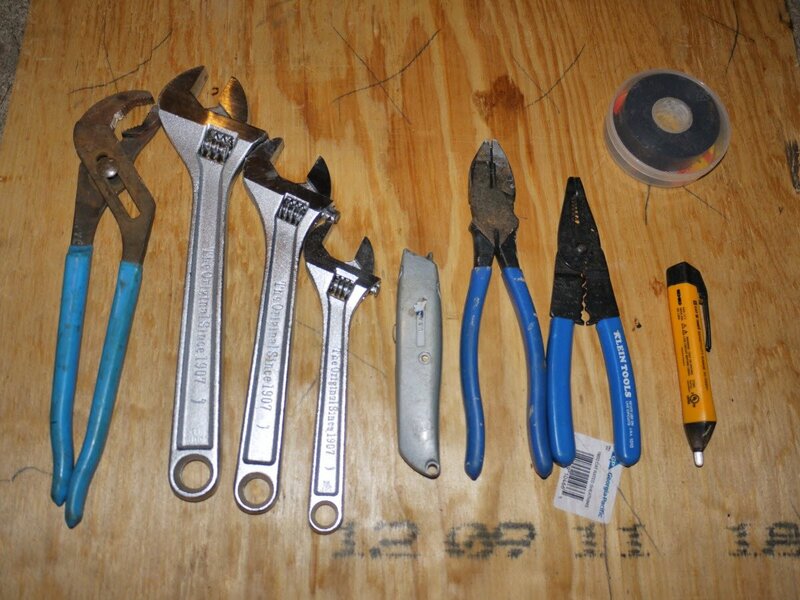 Hand tools for water heater electrical work. 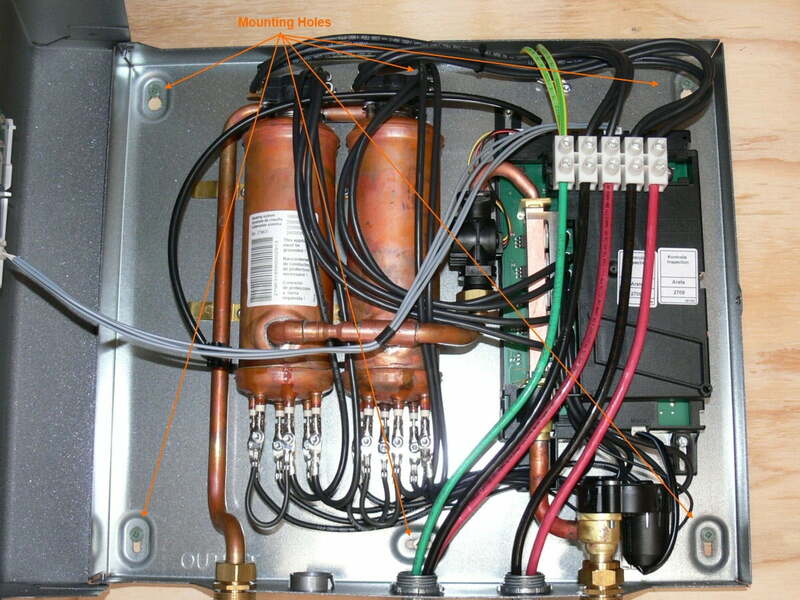 Mount water heater.Position heater on wall in intended mounting position and mark mounting hole positions on wall. Using supplied or suitable fasteners, connect the heater to the wall. Unit must be mounted in upright position, unless otherwise noted by manufacturer. Leave at least 6″ around water heater cabinet for service and clearance for cabinet door opening when choosing a mounting location. Mount the unit upright, in a dry area and one protected from freezing temperatures. Mount the unit upright in a secure, dry position on an accessible wall. Plan and Attach Water Connections.Check local, state and national codes prior to proceeding. Most units require periodic water supply line disconnection for service (inlet filter screen cleaning) and therefore should be plumbed with an easy to disconnect and reconnect attachment. Many use flexible stainless steel connections for this. These are the same connectors used to attach to water softeners and other water heaters. I used a 3/4 inch Falcon Stainless Mega-Flow Super Water-Flex line. 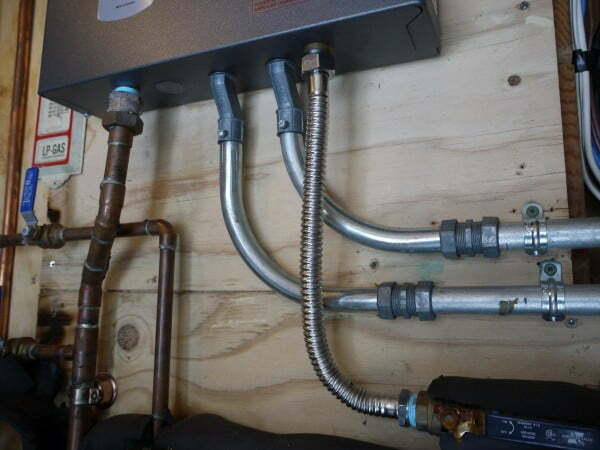 Using these flexible connectors also simplifies the plumbing process for this arm of the water connection. 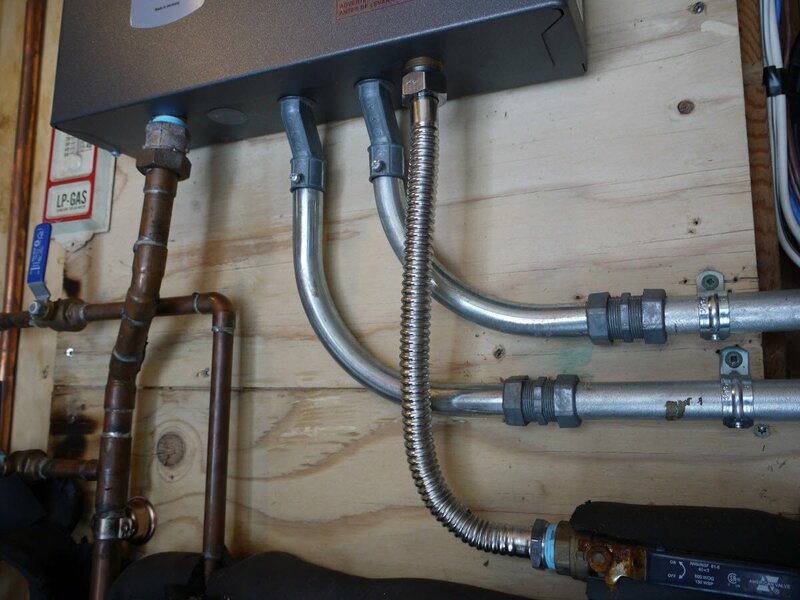 Flexible stainless supply water connection and outlet plumbing with disconnect coupling. The oulet (hot) water connection should also incorporate a disconnect connection to allow for service or replacement. I used a brass coupling with rigid copper tubing. All NPT (normal pipe thread) connections will require Teflon thread tape or paste. Coupling connections do not and should not recieve thread treatment as this can limit the compression of the device and inhibit proper seating of the brass interface resulting in leaks. When using sweat (solder) connections, complete as many of the connections (especially those close to the unit connection) prior to assembly of the plumbing in order to limit potential heat damage to the water heater. 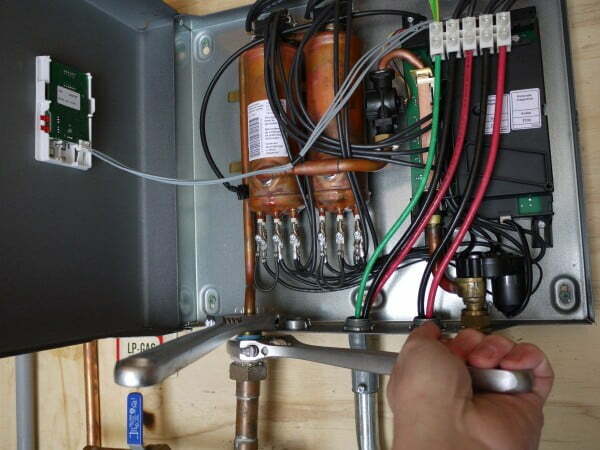 When making the connections to the inlet and outlet fittings of the unit, use care to avoid rotational damage to the unit plumbing by using two wrenches for connections. Once all connections are complete open water supply and check for leaks. Repair any leaks prior to proceeding with electrical connections. Plan and Connect the Electrical Circuits. Prior to any electrical work make sure that the main breaker panel is off! Consult state and local codes. 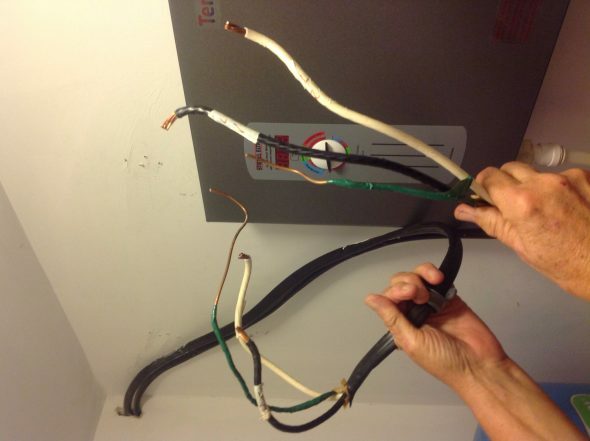 Call a qualified Electrician to perform this work if you have any questions. 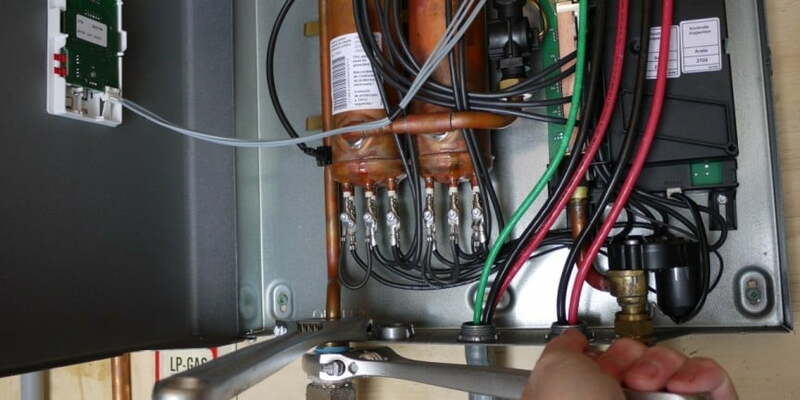 Depending on the make and model of your water heater, you will require one to three double pole (240 volt) 40 or 50 amp circuits. My unit calls for two 50 amp 240 volt circuits and for these circuits I needed 2 double pole 50 amp breakers (check codes to determine if GFIC protection is required), and AWG #6 copper wire. I needed enough wire to to run two wires for each circuit and a shared ground. Check wire requirements for the specific circuit requirements for your unit. Power requirements for this unit = 2 x 50 amp circiuts! Using the appropriate size conduit (3/4″ in my case), measure, cut and connect the conduit circuits from your unit to the breaker panel. I used rigid galvanized conduit with pre-bent turns and compression fittings. Depending on the distance and complexity of the conduit run, you may find it much easier to run the conductors (wires) through the conduit sequentially, as you connect the conduit. Pulling #6 copper through long or complicated runs of conduit is no fun and can be much easier if the wire is passed as you construct the conduit. Electrical circuits for the Stiebel Eltron unit. Dual 240v 50amp circuits – closeup of conductor connections inside unit. Attach the conductors to the appropriate connectors in the unit. Consult the product manual for your unit. The connections should be marked by “L1” “L2” (Live 1, Live 2) or similar and the ground connection indicated by a ground symbol (⏚). Remember these are double pole wiring and each live conductor is “hot”. The ground for this unit is a single conductor connected to the ground connection. Close Unit Cover, Turn On Electricity and Power Up Unit.Close water heater cover and fasten cabinet screw. Turn on power breakers. Check unit display to varify power and operation. Open hot water faucet to purge system of air. Adjust temperature setting of unit control to desired level. Confirm unit function and hot water at tap. Adjust temperature as needed. As a followup, we have used the Stiebel Eltron Tempra 24 plus in our central Minnesota cabin for almost 2 years and could not be more happy with the performance. Our cabin has only one bathroom, but the plumbing to the shower is 3/4″ and the shower head set up for high flow, so the demands for a shower can be high. We find setting the unit to around 130° in the winter and around 120° in the summer provides perfectly hot showers and gives us all the hot water we need. 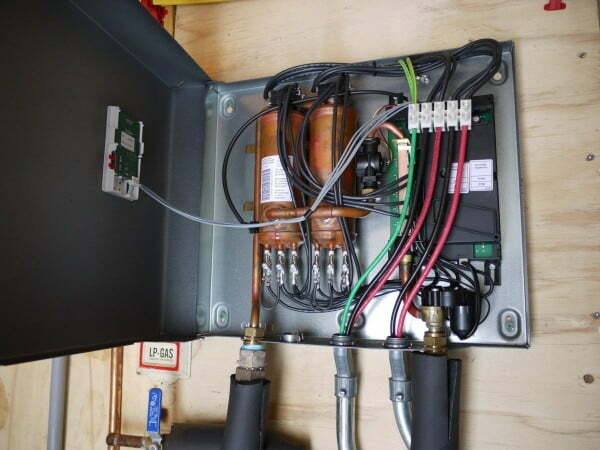 One aspect of using the unit with a well reservoir tank that we have noticed is the effect of changing water temperature related to refilling of the reservoir tank. Our reservoir tank is located in our warm mechanical room, and water in the tank eventually warms to the temperature of this room. Once we start to draw down the water in the tank, it is replaced with cold well water and the supply water temperature quickly drops. The end effect is changing hot water temperature at the tap. This is usually not a big problem, but we will plan our showers accordingly and know the second shower will need adjustment of the shower mixer. 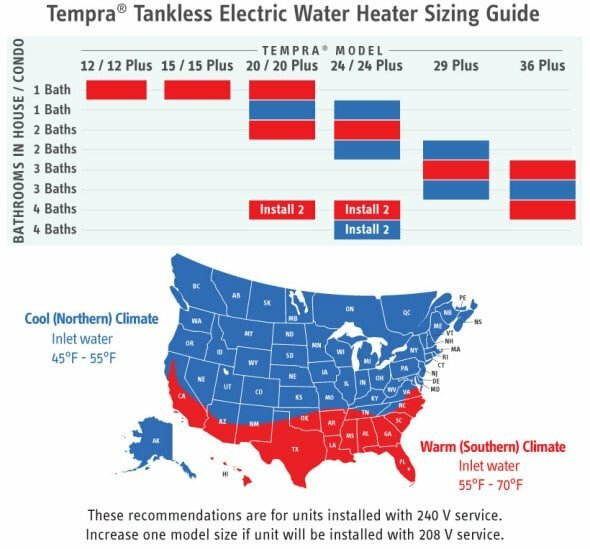 Plan placement of tankless water heater -- consider access to unit, ease of plumbing, distance to end use (longer = more lag time for hot water) and ease of wiring. Plumbing and electrical hand tools for tankless water heater install. Tankless water heater mounted to utility room wall. This unit requires two 240v, 50 amp circuits! Conduit run from water heater to break panel. Conduit carrying #6 copper conductors for the water heater. Electrical circuits for the Stiebel Eltron unit. Dual 240v 50amp circuits - closeup of conductor connections inside unit. Great write up on this. It gives me inspiration to attempt this myself as I feel I am an advanced diy and have worked on numerous plumbing projects. I would hire an electrician though. I am curious why you went with the soldering route for the hot out rather than the flex easy connect line. If I installed one similar to this probably the 20 model I live in Florida would I need to solder the hot line or could I use an easier connect line? You can use flexible stainless connectors for both the hot and cold side. I can’t exactly recall why I didn’t use one on the hot side – it would have advantages (easy disconnect, flexible if any movement, etc). The connectors I used (Falcon Stainless) are rating for working temps of -40 – 220 degrees Fahrenheit and are intended for hot water too. If you use the flexible connectors, I would highly recommend using the best quality products. Those from Falcon Stainless are very good and offer better flow and much higher quality compared to the cheaper braided connectors. Beautiful. Yes, I agree quality is better. I plan to use the same Falcon connectors along with the same brand tankless. 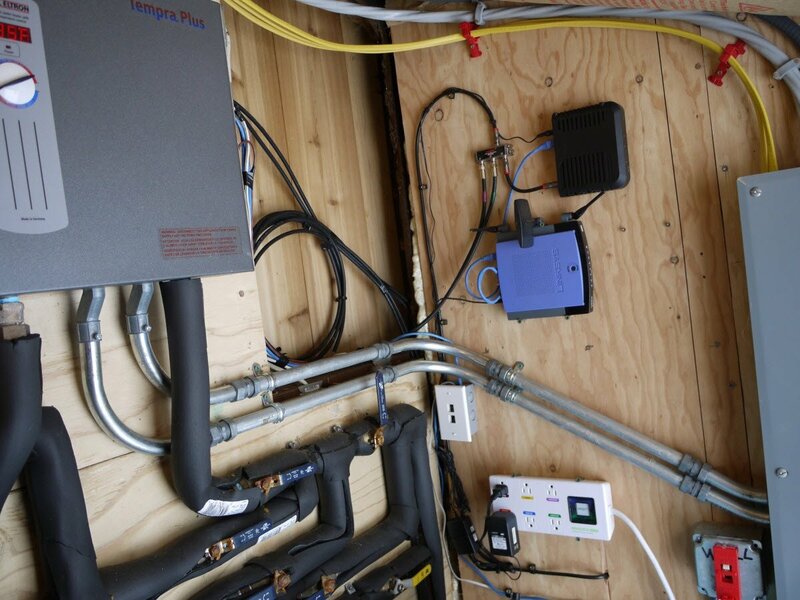 It appears it might be the one tankless that is getting rave reviews. Some that I read about only have problems. Hopefully the electrician will say our junction box can handle the tankless and everything will go smooth for install. Thanks again. Great information, thanks for taking the time to document this DIY install. I have everything basically set to install a 24Plus in a 2 bath, 2 BR SC beach home. I have a question regarding the electrical. I was going to run both ground wires and connect them to the unit, but I see you only have one. Did you twist the other ground to the attached one further back in your wiring? Also, I was planning on running both circuits wiring through a single conduit. What do you think? The Stiebel Eltron units do not require more than a single (appropriately sized) ground. 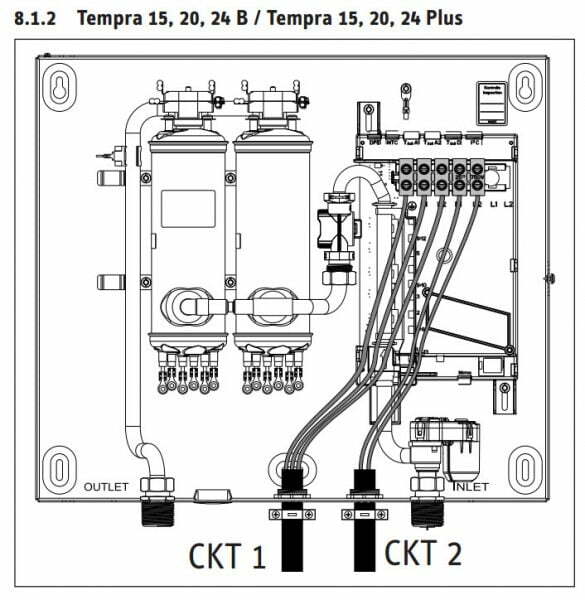 Here is a wiring diagram for the 24 plus tankless heater. The wiring block will be labeled from left to right as follows: ⏚, L1, L2, L1, L2. The ground symbol (⏚) is the connection block for your single ground wire and the L1 and L2 are connection blocks for the hot leads from the double pole (240v) breakers. So for this unit from left to right you should connect the following: ground,hot,hot,hot,hot. As far as the conduit and number of wires you can run in a single conduit will depend on the size of the conduit and the size of the wires. Active conductors (wires) product heat which limits the number and size of wires within a conduit. You may also use a sheathed cable of the appropriate size that does not require conduit. If you do use a combined sheathed product (Romex type), you probably should not run it in conduit as it is not allowed to dissipate heat correctly. For the Tempra 24 Plus requiring 50A circuits you should use AWG 6 wire, therefore if you use 1″ conduit you can run up to 6 wires. If you use 3/4″ conduit (as I did) you can only run up to 4 wires and will require two runs of conduit. Thanks for the information, and the chart. I have 3/4″ non-metallic liquidtight conduit which I planned on running the 4 hots and a single ground wire though. Am I correct that you just cut and tied off the second ground wire since the Stiebel only requires one ground? I’m using sheathed 6/2 AWG, but I will take the outer sheath off before running it through the conduit. One last question. I already purchased some flexible 3/4 inch hose from Lowes for the hot and cold. How much better with the flow rate be using the brand you linked to? If negligible I’d rather not spend any more $. Concerning the wire, I would not recommend removing the sheathing of the wire you have. The sheathed wire is only rated for the load you plan to use if left intact. Using the individual wires after manually stripping them is a bad idea – doing this with a 240v 50 amp circuit is a really bad idea. I would recommend using the sheathed wire as is or within a conduit approved for the wire. You may need to contact the wire manufacture for more info regarding running sheathed wire within conduit. 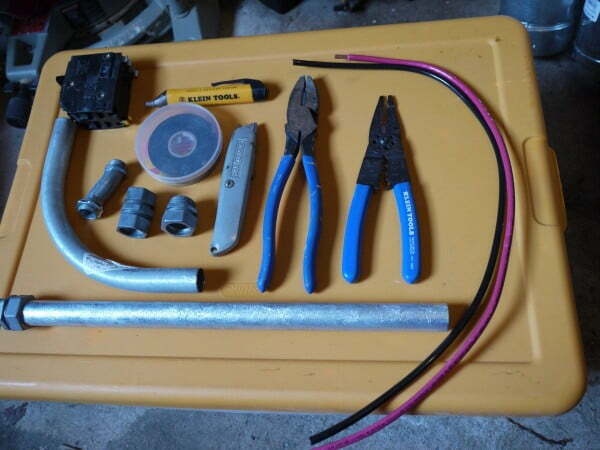 Alternatively, you could return the sheathed wire and use AWG 6 THHN individual wires (you can easily get them from most building supply stores like Home Depot or Lowes). Stiebel Eltron recommends stranded wire too. Regarding the flexible stainless connectors, it really depends on what they carry at your local Lowes. I have found that some of the local Ace Hardware stores carry Falcon stainless water connectors. You can look through the connector to get an idea if there will be a significant reduction in flow – lower flow connectors will have narrower internal diameters or areas of narrowing. Good luck. I would do a bit of checking before you wire this thing to be sure you are doing it in a safe, code compliant way. These units use a lot of electricity – be safe! **Is that a #6 ground wire also? How did you get that big wire connected to your panel’s ground bar?? I just installed this same unit but was confused about the ground wire as well. Should I not have both ground wires together? I turned on the unit and it triggered both circuits. Could it have been that I have both ground running together? This unit won’t turn on now. You only need one ground back to the electrical panel. The ground needs to connect to the ground buss if a subpanel or the ground/neutral buss if connected to your main panel. Each of the other two (or four if your unit requires two circuits) are hot line wires (L1, L2) coming from your double-pole 240v breaker and should not be connected to the ground. Go back and make sure the wires are connected properly according to the wiring diagram for your unit. The single ground will connect to the unit lug marked with a ground symbol. The other wires (all of which are hot) connect to the L1, L2 line (hot) lugs in the unit. Good luck and be safe – if you have any questions about the electrical connections call an electrician! I’m doing ge same thing. I don’t know what to do with the 2 ground wires. What did you do? I am looking to install one in a small second home. The home is on a crawl space. My plan was to install it in a kitchen floor cabinet (30″ wide x 34″ tall) where the current regular tank plumbing comes up from crawl space. Any issue putting in the cabinet? I also have well water, have you used scale inhibition filter or other filters? Each manufacturer will have clearance requirements for service and safe operation. Aside from these, I am not aware of any code issues with enclosing your water heater. This may not apply to gas units. Obviously the safest route would be to ask your local inspector. I do use a whole house in-line sediment filter for our well water system, which is upstream from the water heater. Hello, please help, I live 60 miles from the closest professional that could do this. I’m just replacing my seisco 28 with a tempra 24. I’m confused because I have 2 60 Amp double poled circuits each with its own ground. I’m not sure what to do with extra ground.